An Ale of Two Families. Brewery Lost in a Bet. An Ale of Two Families. Brewery Lost in a Bet. L-to-r: Bridget Smithwick, Alan Smithwick and Ian Hamilton (brewer). Deauville, a long-time magnet for Europe’s rich and famous, was all abuzz for the races in August 1918, even though the Great War was still being waged. 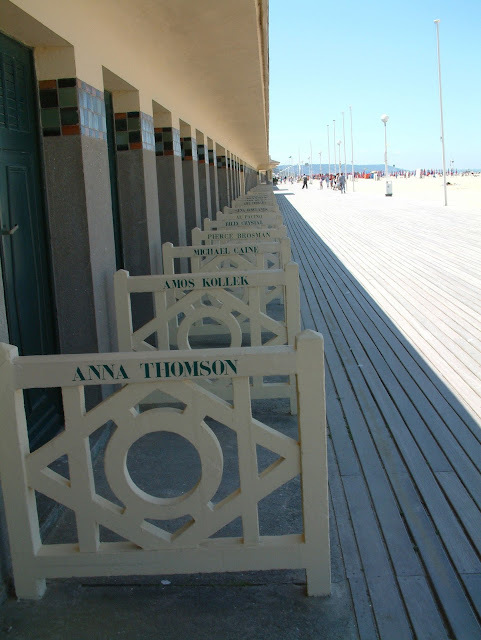 One Irishman had set his sights on an aristocratic French fillé. He had opposition from a Venetian count. 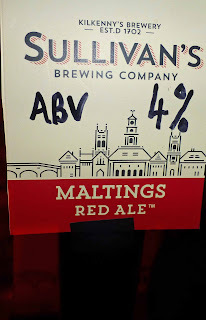 Sullivan, a gambler rather than a brewer, bet the family brewery on a horse to impress the Frenchwoman. He lost and, not fancying a duel with the count, had to settle his debts. 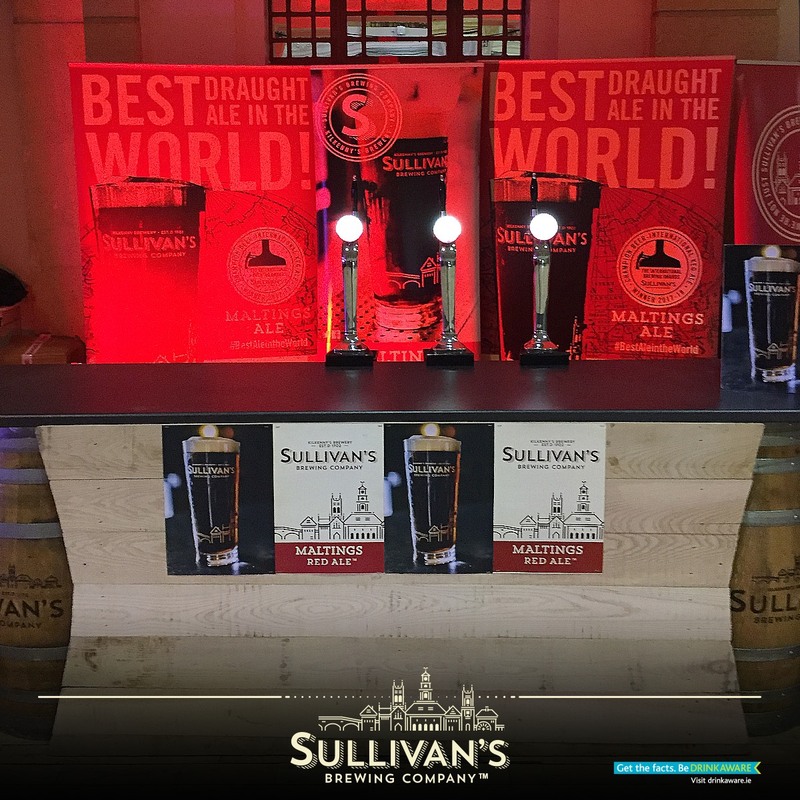 In Kilkenny, as a result of the wager, the Sullivan brewery (established 1702), eight years before Smithwick’s, was taken over by their rivals (“in a kind of a white knight rescue”) and the Sullivan name vanished from the enterprise. Another hundred years on and, in 2014, Diageo moved the production of Smithwick's to Dublin. 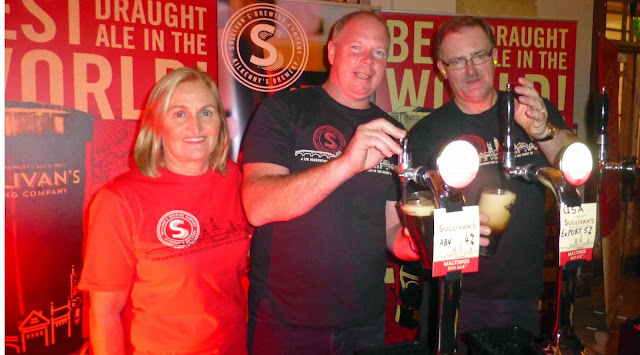 But the Sullivan story has been revived over the past year or two with the emergence of a new Sullivan brewery, backed by the two intertwined families, the Sullivan’s and, yes, the Smithwick’s (keen to keep Kilkenny’s brewing tradition going). 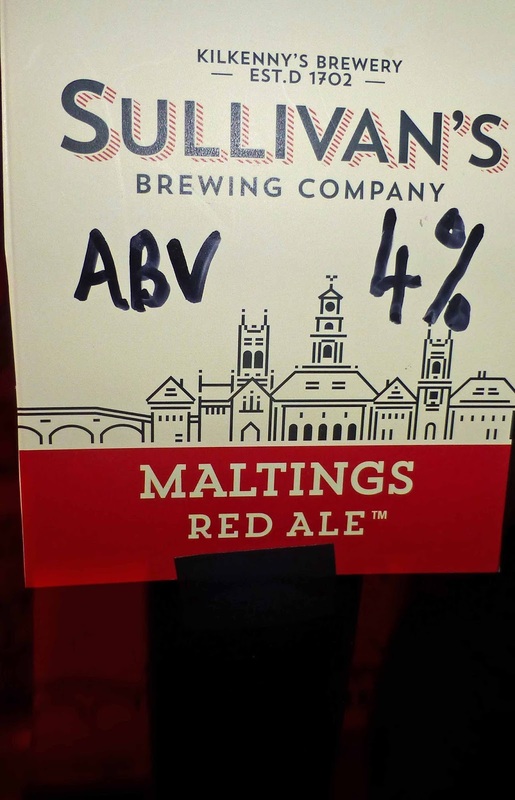 And, already, their Maltings Red Ale has been declared the “best Draught Ale in the World” at the International Brewing Awards, also known as the Oscars of the beer world. They are the 1st Irish Brewery ever to win this competition that hosted over 1,200 beers from 50 countries. Isn't that a nice welcome back for Sullivan’s? Sullivan’s were represented in Cork City Hall at the weekend for the Franciscan Well Great Irish Beer Festival. Bandon educated brewer Ian Hamilton said their ale can be found in Ireland, England and Scotland. C & C is their distributor but Sullivan’s “is totally independent”. I had missed out on a chance to sample the ale on a recent visit to Kilkenny so was delighted to try it in the City Hall. It is a delightful refreshing beer, with a ruby tinted colour, lots of flavour, yet very well balanced with an ABV of just four per cent. Three darker malts and three hops are merged here, so there’s a lot going on. Yet, it is so well made and balanced that it is easy drinking and easy to see why the judges went for it at the International Beer Awards in the UK. Well worth seeking out. And if you are in Kilkenny why not visit their Taproom, an outlet for the Smithwick partnership with direct descendants of the Sullivan family. Together with Ian Hamilton, one of Ireland’s most eminent contemporary master-brewers, they are bringing artisan brewing back to Kilkenny. It’s not just beer at the Taproom. You can have a pizza from their wood-fired oven and other tasty dishes as well. Prefer to eat and drink outdoors? Well, they have a fully covered outdoor, heated seating area. Details here. Man does not live by bread alone! Not sure that Arbutus Bread would go along with that. Especially after their latest loaf, a very tasty white bread that is made with, among other things, beer from Eight Degrees Brewing Company in Mitchelstown. 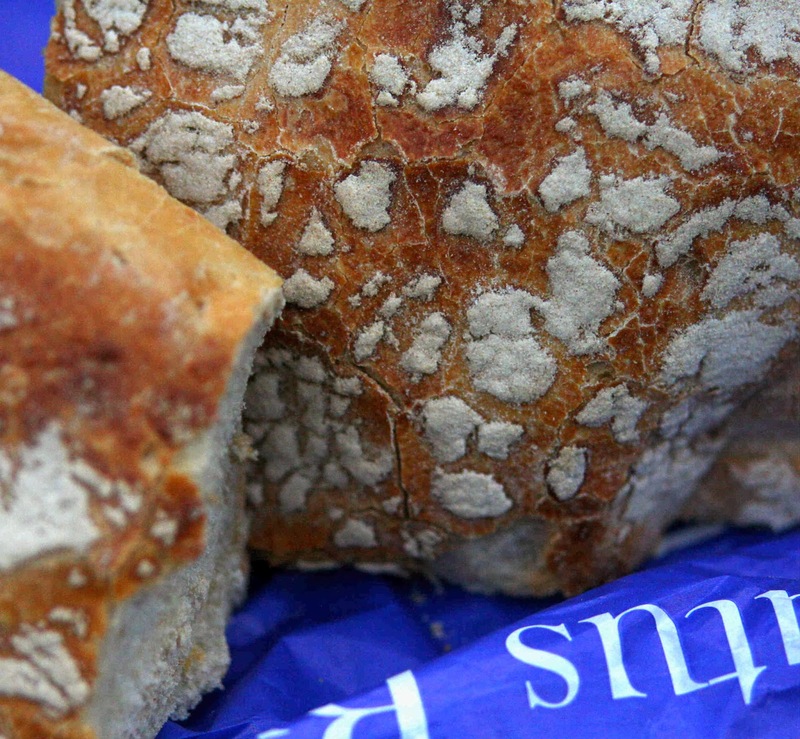 Picked up a loaf in Bradley’s at the weekend. It didn't last long at all. What a crust. Couldn't wait to try it. Just added some Glenilen butter for the first slice. Fantastic. Some homemade gooseberry jam for the second slice. Superb. Ain’t going to tell you about the next slice. Nor the one after that. Experience it for yourself. Am I the only one thinking that the Kinsale Pale Ale is the best around? Renewed acquaintance with this gem, by Black’s, in Jacque’s last week and thought it was just outstanding. Loved the way the flavours spread over the palate from the first sip and that dry clean lingering finish. Indeed, linger is the word. Took my time sipping, the better to enjoy every single every drop. 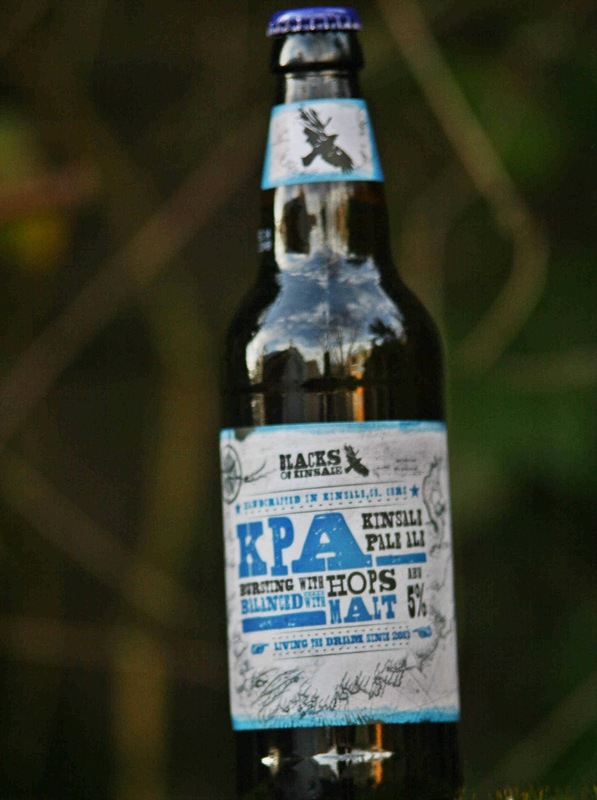 The very next day I called in to Bradley’s to get a wee stock of the KPA and here Michael Creedon,helpful as always, introduced me to the latest beer from Black’s, Ireland’s first Black IPA. Another gem that might well confuse you because of the dark colour and chocolate and coffee tones. Very happy with that one, though I must confess I’d have a slight preference for the KPA. Kinsale have moved up to the popular 500ml size and I'd like to see more brewers follow suit and that includes Franciscan Well. I do like a wheat beer and the Well’s Friar Weisse is a favourite. Up to recently it was available only on draught and in that form I enjoyed a few out in Blairs Inn. Now is it in bottle but only in the 330ml size, same as their Rebel Red. Still, bottle size notwithstanding, it is a very tasty drop - love those refreshing flavours. Kinsale Pale Ale ABV 5% - An exciting fusion of Cascade and Citra hops inspires tropical and citrus flavours that are beautifully balanced with the malty sweetness. The taste dollops a smack of citrus onto the palate – grapefruit and lime – alongside more sweet pineapple and tangerine a decent little malt body fairly creamy, with definite biscuit and cake-dough sweetness and straw overall very well balanced. Clean and crisp citrus bite to finish on, which lingers for a while alongside the sweet tropical fruit notes. - Alltech Dublin Beer cup bronze medal winner 2013. 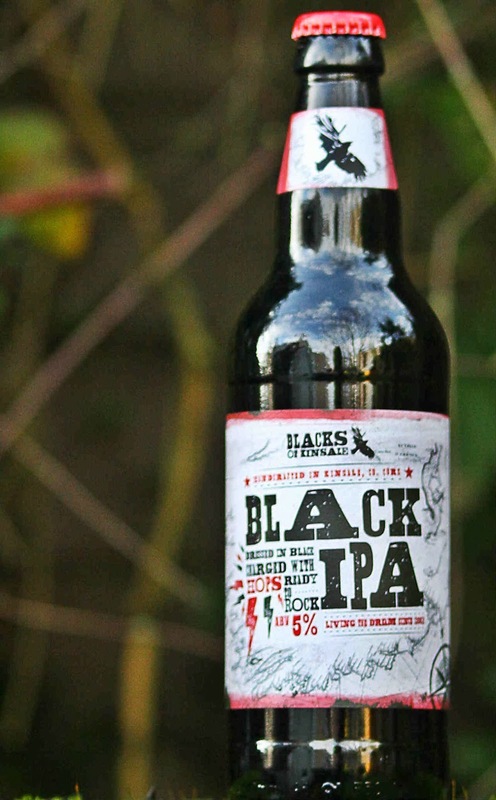 New from Blacks of Kinsale, Ireland's first Black IPA! 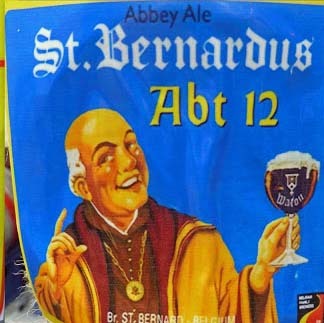 A unique beer that ambushes your senses, it pours dark with a creamy beige head but tastes light and hoppy! Complex hoppy fruity flavours and aromas mixed with roasty bitter chocolate and coffee tones. Low carbonation for a smooth stout like finish. Dressed in black, charged with hops and ready to rock. Any county that can hold a banquet with all the food and drink coming from within its own border, as Clare did in Ennis on October 5th, must have some good restaurants. 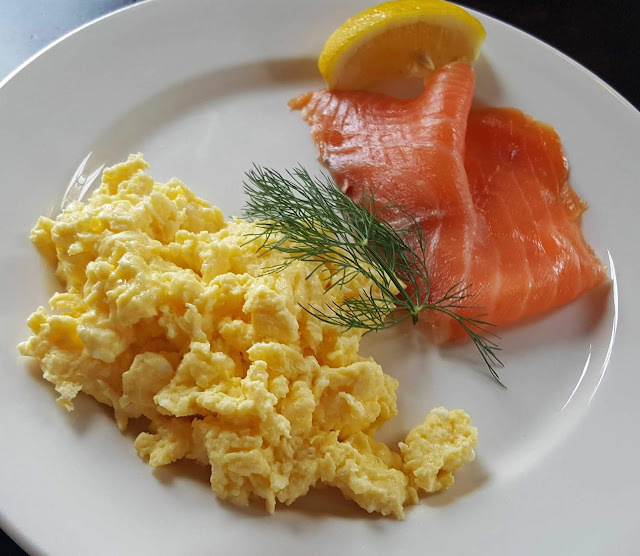 And there are some brilliant ones in the Banner – they regularly turn up on the awards list - but the one we choose on a recent overnight stay was the Wild Honey Inn in Lisdoonvarna. In a relaxed roadside pub just outside the town, Aidan McGrath turns out delightful dishes. We called pretty early, just after six and, having been on the go all day, had a good appetite. First though, a drink. 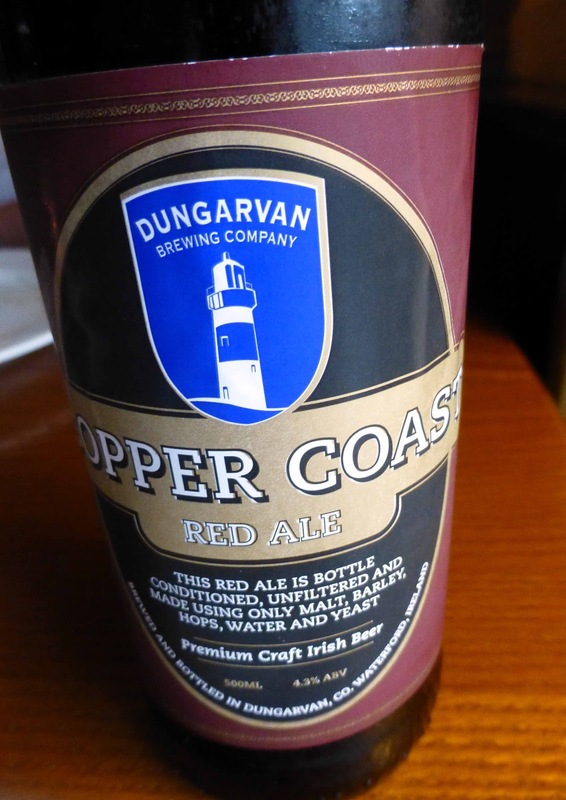 Spotted some craft beer on the counter and picked a bottle of the Copper Coast Red Ale made by the Dungarvan Brewing Company. Settled into our comfortable seat and, with help from the friendly waitress, we ordered. 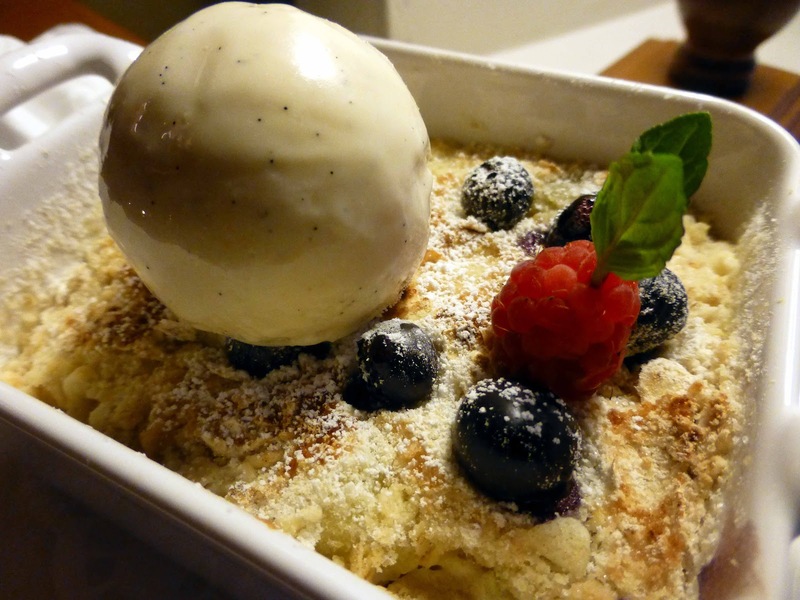 As it turned out, our dishes were all off the Specials menu, with the exception of the exceptional dessert. 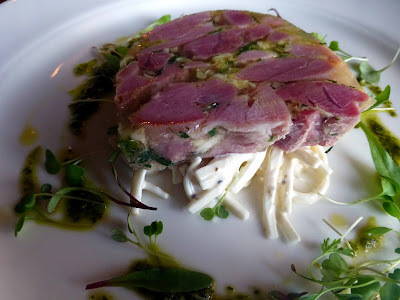 My starter was the Ham Hock Terrine, celeriac remoulade, salsa verde (€8.90). Quality ingredients in a well presented dish and the same could be said about CL’s starter of Dill Cured Salmon, pickled fennel and cucumber, sauce gravadlax (8.90). 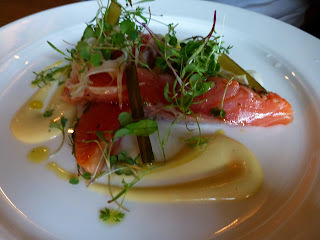 Two super tasty starters and we had confirmation that all good things we had heard about the Inn were true. We were tempted by the Halibut Troncon with Saffron ratte potato but both went for the other special: Veal Feather Blade, pearl barley, carrot and cumin puree, young leeks (€19.90). Aidan said this was a rare cut and he sure made the best of it. The whole dish looked well and tasted well. 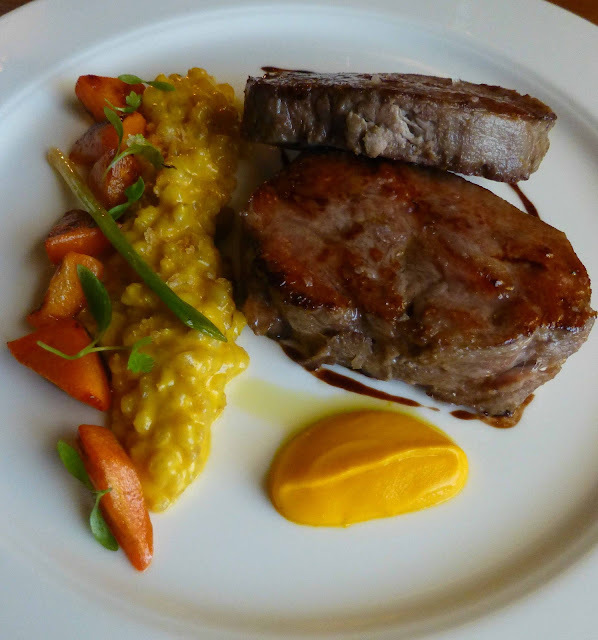 You could have cut the meat with your spoon and the use of the pearl barley was also a rare delight. Even the potatoes that came as a side were top notch. Quality all the way from the farm to the kitchen to the table. The Apple and Blueberry crumble that we shared for dessert was another winner. The humble apple was the main ingredient, a beautiful example of the fruit, cut into plentiful mini chunks, so juicy. And the fruit wasn't buried under a mound of crumble, just a thin tasty sheet. A gorgeous combination to end a gorgeous meal. With the friendliness of Aidan and his crew and the top drawer food, the Wild Honey was one of the highlights of our trip to the delightful county of Clare, a place where there is so much to see and do, not to mention so much to eat and drink! Pilsner style for warm days, just like this week! 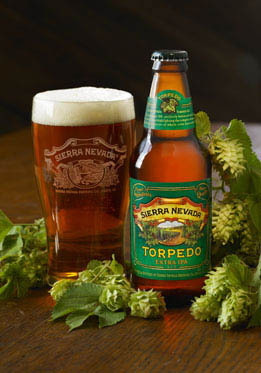 This lager is crisp, refreshing, friendly, well balanced with a dry finish. Hazy golden colour, good flavours with clove coming through. Well made, tasty. And very smooth. Note that it has special pouring instructions. This multi medal winner is their flagship beer. It has a deep amber colour and is full bodied. The purity of the ingredients is stressed and it is well balanced, flavoursome and tasty. This is the big one, big on flavour, big on hops, big on bitterness and on abv. Not for beginners! It has the highest bitterness of the four at 65! My preferences here are for the two lightweights, the Summerfest and the Kellerweis. S-Ale-vation though is found much closer to home in a bottle of Wisdom Ale (by Elbow Lane). 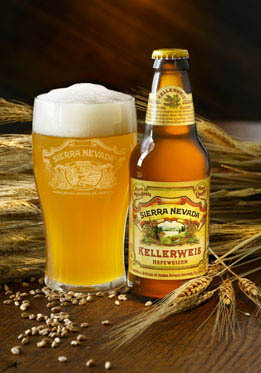 It has an abv of 4.5% and, like the Nevada range, is available from Bradley's, North Main Street. Took a sip of the dark amber liquid and found it more rounded than many others, no extremes of flavour, no overload. It has a medium body with toasted malt (even chocolately) flavours. Brewed to go well with food or as a stand alone pint, I reckon they've succeeded! My second tasting and my opinion that this is the ale for me is reinforced. The range of Sierra Nevada beers are available at Bradley's, North Main Street as is the Wisdom Ale. Check out their new website here. 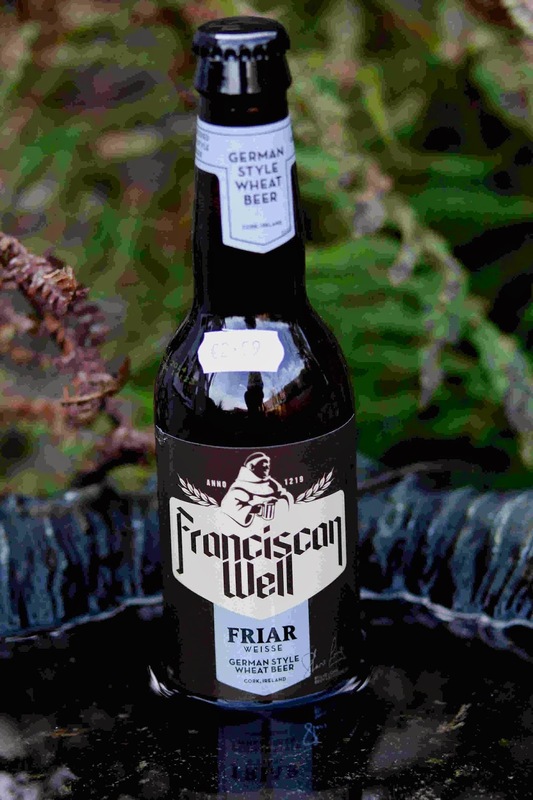 Craft Brewing has taken off in a big way this last 12 months but the pioneering Franciscan Well on Cork’s North Mall still has a trick or two up its sleeve. And indeed, the brewers there have produced two of the best beers of the year in my opinion: The Shandon Century Extra Stout and the formidable Bellringer, both limited editions. The Shandon made its debut at the end of October. This was a fabulous stout and I was lucky enough to get a bottle or two from the 1,000 made, also enjoyed a couple of tastings, each with cheese. And perhaps the best match-up came during the Jazz Weekend when Willie Healy of URRU matched it with a mature Hegarty’s Cheddar at the pub itself. Memorable stout – like to see it back again sometime soon! The Bellringer, also a 1000 bottle run, came about a month later and only last Monday came the news from the brewery: “Bellringer is sold out. Next batch will be a bottle conditioned I.P.A. “ You might be lucky as, of yesterday, Bradley’s in North Main Street still had a few bottles left. 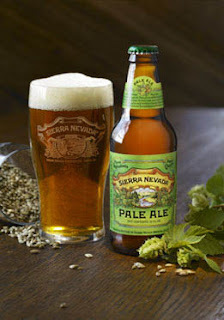 I finished mine off last night and was delighted with it, perhaps the best Irish ale I’ve tasted. Like to see that come back as well but in the meantime I’m looking forward to the IPA. And another Franciscan event to look forward to has just been announced: “Our annual Cask Ale Festival will take place on the 10th, 11th and 12th Feb. It’s going to be one of the best ones yet!” They usually keep to their word so mark this in your diary. All goes to show there is life in the Old North Mall dog yet and those newbies, promising and all as they are, will have their work cut out to top the Cork star. We can only benefit from the brewing battles ahead!